A comprehensive comparison of Dewalt DWE7491RS and Hitachi C10RJ. If you have been shopping around searching for the best value table saw in the market and have narrowed it down to the Hitachi C10RJ and Dewalt dwe7491rs, wondering which one of the two you should buy, then this guide is for you. Here we will compare these two table saws, citing similarities and whee each of them excels and hopeful help you make an informed decision on which one you should be getting. Here are some of the things and specifications that are worth mentioning about the Hitachi C10RJ jobsite table saw. It is powered by a direct drive universal 15 Amp motor which produces up to 4,500 RPM which is efficient in handling many tasks. It comes with a 10″ 40-Tooth carbide tipped blade that offers high capacity cutting. To help handle cuts that ranges from 3-1/8″ (at 0 degree) to 2-1/4″ (at 45 degrees), it comes with a very effective Bevel range. The working table top area measures 28-3/4″ x 22″ and has an out feed support area of 28-3/4″ x 2″ to ensure ease of work and better support. There is an additional telescoping table extension support of 35″ to the right and 22″ to the left. For storage of accessories, tools and other items, it has a convenient on-tool storage space. Below are some of the things that make up the Dewalt DWE7491RS. It comes with a Rack and Pinion Fence System that makes adjusting a seamless and accurate task. It has a 32-1/2 inch Rip capacity which can easily be used in cutting a wide range of larger shelving and trims. The dust port diameter measures 2.5 inches. It is powered by a powerful 15 Amp motor that can quickly and easily rip through hardwoods. Its unique flip over ripping fence lets one get narrow rip cuts. It has a 2-1/2-Inch dust collection port that easily connects to a vacuum to conveniently collect dust. Hitachi C10RJ vs Dewalt DWE7491RS – Which One To Buy? To give you better understanding on which among these two professional table saws and which one you should go for, here are some of the differences using various factors. One of the flaws that come with many table saws is that they are usually designed with legs too close together making them less stable since there is increased chances of tipping over. the Hitachi C10RJ comes with a nice, stable stand that holds up pretty well when working. The legs are set apart and the outfeed extension ensures that it stays square without needing any reinforcements. 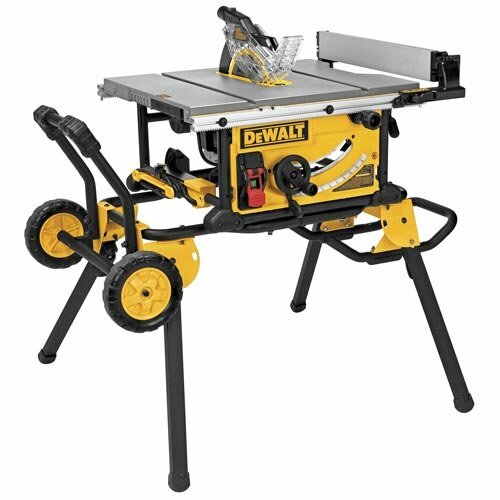 Dewalt DWE7491RS on the other end offers two options to choose from when buying: One with a 28 inch rip capacity which comes with a folding stand and the other option of 32 inch which comes with a mobile stand. From the stability point, both of these table saws have stood and have excelled in offering a stable solution that ensures that you get good efficiency without wobbles or the risks of tipping over while working. Whichever table saw you opt to go with between the Hitachi and Dewalt, stability is a non-issue. 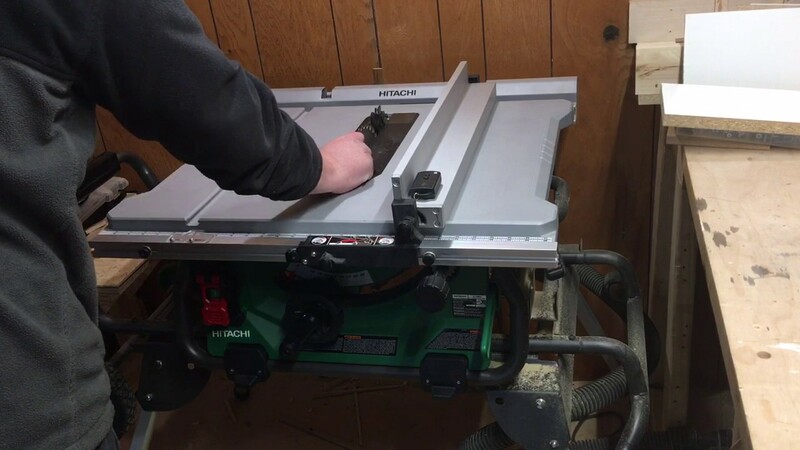 By market standards, a good table saw should feature 10 inch blades and be powered by 15 amp motors which makes and offer good convenience, easy folding stands yet still remain stable when in use. Anyone who has used Dewalt table saws before will tell you that the Hitachi C10RJ resembles the DEWALT DWE7491RS in appearance. But are they similar in performance as well? Both of these table saws uses 15 amp motors, but runs on different RPMs. The Hitachi have blade speeds of 4,500 RPM while the Dewalt DWE7491RS have a speed of 4,800, which basically means that the Dewalt motor is optimized for more speed, an cutting efficiency. Having more power isn’t sometimes that important if you lack a cleaner finish on the woodwork, therefore, you also need to be keen on the blade, table and beveling of the saw you are getting. The Hitachi C10RJ comes with a 10 inch and 40 tooth carbide blade while the Dewalt DWE7491RS has a 10-inch 24-Tooth carbide blade. So which one should you choose? Going by experience, and from what other woodworkers will tell you, more teeth does not mean that you are getting better cut especially when working with solid wood. The opposite is true. More teeth means that there will be more heat that leads to slower cuts. Usually having 20 – 30 teeth on a 10 inch blade works perfect. And going by reviews from top online stores, Dewalt is a much better table saw than Hitachi when it comes to handling solid wood. Many of the reviews from dozens of online stores and forums also seem to agree with our findings that Dewalt DWE7491RS is a far much better choice than the Hitachi C10RJ in many aspects.